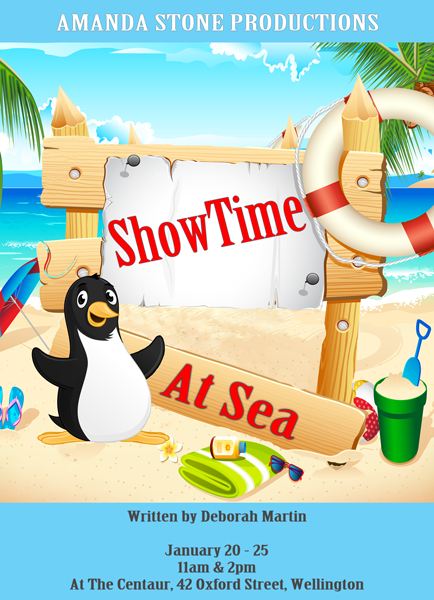 Experience all the fun of summer in ShowTime At Sea, the story of a gang of bumbling pirates and their search for a buried treasure. Unfortunately for them however, their search is being impeded by an assortment of different characters from in and around the sea. The show features a parade of terrific sea faring performance groups who perform 12 great items. There is a performance item suitable for every level and they're all are based around the central theme of the sea. Along with songs there is a hilarious mini-play, a cool sun smart rap and a moving finale performed by the whole cast. For the staging of the show only a single, simple set of a seascape, beach or island scene is required. Brought to life by an eclectic cast of jellyfish, pirates, penguins, surfers and kids, ShowTime At Sea is a colourful, fun and entertaining show. The local kids are enjoying a day at the beach when they spot a gang of bumbling pirates looking for treasure. Their search is interrupted by the lifesavers who outline lots of educational safe swimming tips in the 'Lifesavers Song'. The pirates creep back on stage but are thwarted by the swinging 'Beach Towel Bop' chorus and then by the summertime rappers who have lots of fun and informative advice on sun protection. Thinking the coast is clear the pirates sneak back onstage and continue their search but are nearly mistaken for models in the summer fashion show! The fashion show host introduces the models who are all cool cats in their goggles, flippers and the latest summer gear. As they all bop off stage the posh 'Penguins on Parade' chorus waddle on and soft shoe shuffle in their fabulous penguin parade! Coming up next is a colourful chorus of sea creatures who swing, sway and strut their stuff, partying in an under the sea style. Their party entertainment is provided by the jiggly jellyfish in the 'Jellyfish Roll'! Next is a mini play telling a playful story of a family's planned trip to the beach. Back at the beach, the board riders are showing off their skills in the 'Boogie Board Boogie' chorus. When they exit the pirates are back, only to discover that the treasure has already been found by the lifesavers. The pirates are tired of seasickness, swabbing the decks and lonely days at sea so decide to join up as lifesavers. The tale of the wonderful world below the sea ends with a moving finale reminding everyone to "look after the ocean, look after the sea". The cast size of ShowTime At Sea can fluctuate dramatically as the show is able to support a small cast consisting of a single class or year, to a larger cast made up of the entire school. The 12 performance items included vary in difficulty but there are items suited to most age groups and it is envisaged that ideally each item would be performed by a separate class or year. The performance items are linked together by two seafaring narrators who are accompanied by a band of pirates and a number of other supporting characters along the way. The supporting characters give the chance for more children to have spoken dialogue in the show and also let action occur downstage while the different performance groups are moving on and off the stage. The narrators appear during the opening of the show and just before the finale is performed while the rest of the show is comprised of performance groups like the surfers, pirates, penguins and jellyfish. Since there is less of an emphasis on spoken dialogue for these groups casting should be more focused on the singing ability of the performers with any spoken dialogue given to the best actors in each of these groups. The roles of the two narrators however should be given to the strongest actors who are also able to work off of each other well.